In a new paper published in Physical Review Letters, physicists Géraldine Servant at CERN, the Autonomous University of Barcelona, and CEA Saclay in France, and Sean Tulin at the University of Michigan in Ann Arbor, call this theoretical scenario "Higgsogenesis." "With the Higgs discovery, the final piece of the Standard Model of particle physics has been put into place," Servant told Phys.org. "Now, it is a natural question to ask: could the Higgs boson have been important in the early Universe to help explain two observational puzzles that the Standard Model cannot: the origin of dark matter and the matter-antimatter asymmetry? 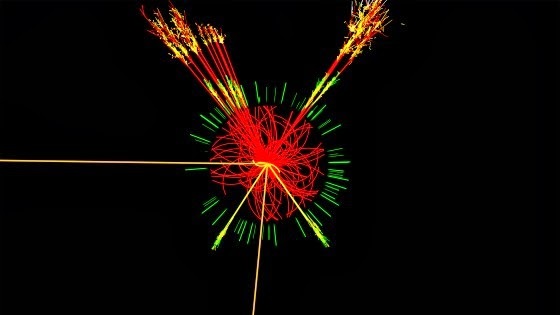 In the very early Universe, the Higgs particle was distinct from its antiparticle. We show that an asymmetry between Higgs and anti-Higgs might have been the missing link connecting the densities of visible and dark matter, which observationally are quite similar." This Higgs could have provided the missing link in one of two ways. One possibility is that, if there were a dark matter asymmetry in the early Universe, then this asymmetry could have transferred to an asymmetry between the Higgs and the anti-Higgs, which then could have transferred to a baryon asymmetry between matter and antimatter. Another possibility is that this sequence could have happened in reverse, where a baryon asymmetry first transferred to a Higgs asymmetry, which then transferred to a dark matter asymmetry. In both cases, the Higgs provides a "portal" through which asymmetries can flow from the dark sector to the visible sector or vice versa. In these scenarios, dark matter would have an asymmetry just like baryonic matter. The physicists proposed two new fermions that couple to the Higgs boson that could have mediated the asymmetry transfers. "Our mechanism relies on the existence of an interaction between the Higgs field and the dark sector, which is a natural assumption in many extensions of the Standard Model of particle physics," Tulin said. "The novelty of our work is to investigate the role of the Higgs in transferring matter asymmetries between the dark and visible sectors. It offers new opportunities for baryogenesis and dark matter generation." In fact, previous research has shown that the Higgs boson may play a role in electroweak baryogenesis and leptogenesis, both of which describe asymmetries in the early Universe. Future experiments may be able to test these proposals. For instance, physicists could investigate Higgs decays at the Large Hadron Collider (LHC). In these decays, the proposed fermions may escape as missing energy that could be detected. "For Higgsogenesis to work, there must be new particles that interact through the weak force," Servant said. "Actually, new weakly interacting particles are not unique to Higgsogenesis, but are part of many different new physics models, and the LHC is actively searching for them. A second prediction is that the Higgs boson can decay invisibly to dark matter particles, and again the LHC is looking for this signature as well."